In 2008, the French government approved a law against Web sites that encourage anorexia and bulimia. In 2012, Instagram responded to pressure to limit hashtags that “actively promote self-harm.” Instagram had 40M users, almost as many as France’s 55M active Net users. Researchers at Georgia Tech several years later found that some self-harm sites on Instagram had higher engagement after Instagram’s actions. “ If your algorithm reliably detects people who are at risk of committing suicide, what next? ” If your algorithm reliably detects people who are at risk of committing suicide, what next? If the intervention isn helpful, your algorithm is doing harm. We often have in mind a particular pipeline: training > model > prediction > people . Sometimes there are rapid feedback loops where the decisions made by people feed back into the model. A judicial system’s prediction risk scores may have no such loop. But the AI that manages a news feed is probably getting the readers’ response as data that tunes the model. 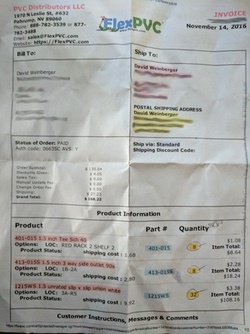 We have organizations that check the quality of items we deal with: UL for electrical products, etc. But we don’t have that sort of consumer protection for social tech. The results are moral panics, bad policies, etc. This is the gap Nate is trying to fill with CivilServant.io, a project supported by the Media Lab and GlobalVoices. Managing fake news is essential for democracy. The social sciences have been dealing with this for quite a while by doing research on individual perception and beliefs, on how social context and culture influence beliefs … and now on algorithms that make autonomous decisions that affect us as citizens e.g., newsfeeds. Newsfeeds work this way: someone posts a link. People react to it, e.g. upvote, discuss, etc. The feed service watches that behavior and uses it to promote or demote the item. And then it feeds back in. We’ve seen lots of examples of pernicious outcomes of this. E.g., at Reddit an early upvote can have dramatic impact on its ratings over time. What can we do to govern online misinfo? We could surveill and censor. We could encourage counter-speech. We can imagine some type of algorithmic governance. We can use behavioral nudges, e.g. Facebook tagging articles as “disputed.” But all of these assume that these interventions change behaviors and beliefs. Those assumptions are not always tested. Nate was approached by /r/worldnews at Reddit, a subreddit with14M subscribers and 70 moderators. At Reddit, moderating can be a very time consuming effort. (Nate spoke to a Reddit mod who had stopped volunteering at a children’s hospital in order to be a mod because she thought she could do more good that way.) This subreddit’s mods wanted to know if they could question the legitimacy of an item without causing it to surge on the platform. Fact-checking a post could nudge Reddit’s AI to boost its presence because of the increased activity. Why did encouraging fact checking reduce rankings, but fact checking and voting did not? The mods think this might be because it gave users a constructive way to handle articles from reviled sources, reducing the number of negative comments about them. [I hope I’m getting this right.] Also, “reactance” may have nudged people to upvote just to spite the instructions. Also, users may have mobilized friends to vote on the artciles. Also, encouraging two tasks (fact check and then vote) rather than one may have influenced he timing of the algorithm, making the down-votes less impactful. This is what Nate calls an “AI-Nudge”: a “second-order effect of influencing human behavior on the behavior of an algorithmic system.” It means you have to think about how humans interact with AI. Often when people are working on AI, they’re starting from computer science and math. The question is: how can we use social science methods to research the effect of AI? Paluck and Cialdini see a cycle of Pilot/Lab experiments > qualitative methods > field experiences > theory / policy / design. In the Reddit example, Nathan spent considerable time with the community to understand their issues and how they interact with the AI. Another example of a study: identifying and reducing side-effects of automated copyright law enforcement on Twitter. When people post something to Twitter, bots monitor it to see if violates copyright, resulting in a DMCA takedown notice being issued. Twitter then takes it down. The Lumen Project from BKC archives these notices. The CivilService project observes those notices in real time to study the effects. E.g., “a user’s tweets per day tends to drop after they receive a takedown notice … for a 42-day period”a user’s tweets per day tends to drop after they receive a takedown notice, and then continues dropping throughout the 42-day period they researched. Why this long-term decrease in posting? Maybe fear and risk. Maybe awareness of surveillance. So, how can these chilling effects be reduced? The CivilService project automatically sends users info about their rights and about surveillance. The results of this intervention are not in yet. The project hopes to find ways to lessen the public’s needless withdrawal from social media. The research can feed empirical legal studies. Policymakers might find it useful. Civil rights orgs as well. And the platforms themselves. In the course of the Q&As, Nathan mentions that he’s working on ways to explain social science research that non-experts can understand. CivilService’s work is with user communities and it’s developed a set of ways for communicating openly with the users. A: I’m doing consumer protection, so as experts like you work on making AI more fair, we can see the social effects of interventions. But there are feedback loops among them. Q: What would you do with a community that doesn’t want to change? A: We work with communities that want our help. In the 1970s, Campbell wrote an essay: “The Experimenting Society.” He asked if by doing behavioral research we’re becoming an authoritarian society because we’re putting power in the hands of the people who can afford to do the research. He proposed enabling communities to do their own studies and research. He proposed putting data scientists into towns across the US, pool their research, and challenge their findings. But this was before the PC. Now it’s far more feasible. Q: What sort of pushback have you gotten from communities? A: Some decide not to work with us. In others, there’s contention about the shape of the project. Platforms have changed how they view this work. Three years ago, the platforms felt under siege and wounded. That’s why I decided to create an independent organization. The platforms have a strong incentive to protect their reputations. Also, at the end of this post I have some reflections on rules vs. models, and the implicit vs. explicit. John begins by framing the book as an attempt to find a balance between diversity and free expression. Too often we have pitted the two against each other, especially in the past few years, he says: the left argues for diversity and the right argues for free expression. It’s important to have both, although he acknowledges that there are extremely hard cases where there is no reconciliation; in those cases we need rules and boundaries. But we are much better off when we can find common ground. “This may sound old-fashioned in the liberal way. And that’s true,” he says. But we’re having this debate in part because young people have been advancing ideas that we should be listening to. We need to be taking a hard look. Our institutions should be deeply devoted to diversity, equity and inclusion. Our institutions haven’t been as supportive of these as they should be, although they’re getting better at it, e.g. getting better at acknowledging the effects of institutional racism. The diversity argument pushes us toward the question of “safe spaces.” Safe spaces are crucial in the same way that every human needs a place where everyone around them supports them and loves them, and where you can say dumb things. We all need zones of comfort, with rules implicit or explicit. It might be a room, a group, a virtual space… E.g., survivors of sexual assault need places where they know there are rules and they can express themselves without feeling at risk. But, John adds, there should also be spaces where people are uncomfortable, where their beliefs are challenged. Spaces of both sorts are experienced differently by different people. Privileged people like John experience spaces as safe that others experience as uncomfortable. The examples in his book include: trigger warnings, safe spaces, the debates over campus symbols, the disinvitation of speakers, etc. These are very hard to navigate and call out for a series of rules or principles. Different schools might approach these differently. E.g.,students from the Gann Academy are here tonight, a local Jewish high school. They well might experience a space differently than students at Andover. Different schools well might need different rules. Student: I graduated from Andover and now I’m at Harvard. I was struck by the book’s idea that we need to get over the dichotomy between diversity and free expression. I want to address Chapter 5, about hate speech. It says each institution ought to assess its own values to come up with its principles about speech and diversity, and those principles ought to be communicated clearly and enforced consistently. But, I believe, we should in fact be debating what the baseline should be for all institutions. We don’t all have full options about what school we’re going to go to, so there ought to be a baseline we all can rely on. JP: Great critique. Moral relativism is not a good idea. But I don’t think one size fits all. In the hardest cases, there might be sharpest limits. But I do agree there ought to be some sort of baseline around diversity, equity, and inclusion. I’d like to see that be a higher baseline, and we’ve worked on this at Andover. State universities are different. E.g., if a neo-Nazi group wants to demonstrate on a state school campus and they follow the rules laid out in the Skokie case, etc., they should be allowed to demonstrate. If they came to Andover, we’d say no. As a baseline, we might want to change the regulations so that the First Amendment doesn’t apply if the experience is detrimental to the education of the students; that would be a very hard line to draw. Even if we did, we still might want to allow local variations. Student: Brave spaces are often build from safe spaces. E.g., at Andover we used Facebook to build a safe space for women to talk, in the face of academic competitions where misogyny was too common. This led to creating brave places where open, frank discussion across differences was welcomed. JP: Yes, giving students a sense of safety so they can be brave is an important point. And, yes, brave spaces do often grow from safe spaces. Andover student: I was struck by why diversity is important: the cross-pollination of ideas. But from my experience, a lot of that hasn’t occurred because we’re stuck in our own groups. There’s also typically a divide between the students and the faculty. Student activitsts are treated as if they’re just going through a phase. How do we bridge that gap? JP: How do we encourage more cross-pollination? It’s a really hard problem for educators. I’ve been struck by the difference between teaching at Harvard Law and Andover in terms of the comfort with disagreeing across political divides; it was far more comfortable at the Law School. I’ve told students if you present a paper that disagrees with my point of view and argues for it beautifully, you’ll do better than parroting ideas back to me. Second, we have to stop using demeaning language to talk about student activists. BTW, there is an interesting dynamic, as teachers today may well have been activists when they were young and think of themselves as the reformers. Student: [hard to hear] At Andover, our classes were seminar-based, which is a luxury not all students have. Also: Wouldn’t encouraging a broader spread of ideas create schisms? How would you create a school identity? JP: This echoes the first student speaker’s point about establishing a baseline. Not all schools can have 12 students with two teachers in a seminar, as at Andover. We need to find a dialectic. As for schisms: we have to communicate values. Institutions are challenged these days but there is a huge place for them as places that convey values. There needs to be some top down communication of those values. Students can challenge those values, and they should. This gets at the heart of the problem: Do we tolerate the intolerant? Student: I’m a graduate of Andover and currently at Harvard. My generation has grown up with the Internet. What happens when what is supposed to be a safe space becomes a brave space for some but not all? E.g., a dorm where people speak freely thinking it’s a safe space. What happens when the default values overrides what someone else views as comfortable? What is the power of an institution to develop, monitor, and mold what people actually feel? When communities engage in groupthink, how can an institution construct space safes? JP: I don’t have an easy answer to this. We do need to remember that these spaces are experienced differently by different people, and the rules ought to reflect this. Some of my best learning came from late night bull sessions. It’s the duty of the institution to do what it can to enable that sort of space. But we also have to recognize that people who have been marginalized react differently. The rule sets need to reflect that fact. Student: Andover has many different forum spaces available, from hallways to rooms. We get to decide to choose when and where these conversations will occur. For a more traditional public high school where you only have 30-person classroom as a forum, how do we have the difficult conversations that students at Andover choose to have in more intimate settings? JP: The size and rule-set of the group matters enormously. Even in a traditional HS you can still break a class into groups. The answer is: How do you hack the space? Student: I’m a freshman at Harvard. Before the era of safe spaces, we’d call them friends: people we can talk with and have no fear that our private words will be made public, and where we will not be judged. Safe spaces may exclude people, e.g., a safe space open only to women. JP Andover has a group for women of color. That excludes people, and for various reasons we think that’s entirely appropriate an useful. Q [Terry Fisher]: You refer frequently to rule sets. If we wanted to have a discussion in a forum like this, you could announce a set of rules. Or the organizer could announce values, such as: we value respect, or we want people to take the best version of what others say. Or, you could not say anything and model it in your behavior. When you and I went to school, there were no rules in classrooms. It was all done by modeling. But this also meant that gender roles were modeled. My experience of you as a wonderful teacher, JP, is that you model values so well. It doesn’t surprise me that so many of your students talk with the precision and respectfulness that you model. I am worried about relying on rule sets, and doubt their efficacy for the long term. Rather, the best hope is people modeling and conveying better values, as in the old method. JP: Students, Terry Fischer was my teacher. May answer will be incredibly tentative: It is essential for an institution to convey its values. We do this at Andover. Our values tell us, for example, that we don’t want gender-based balance and are aware that we are in a misogynist culture, and thus need reasonable rules. But, yes, modeling is the most powerful. Q [Dorothy Zinberg]: I’ve been at Harvard for about 70 yrs and I have seen the importance of an individual in changing an institution. For example, McGeorge Bundy thought he should bring 12 faculty to Harvard from non-traditional backgrounds, including Erik Erikson who did not have a college degree. He had been a disciple of Freud’s. He taught a course at Harvard called “The Lifecycle.” Every Harvard senior was reading The Catcher in the Rye. Erikson was giving brilliant lectures, but I told him it was from his point of view as a man, and had nothing to do with the young women. So, he told me, a grad student, to write the lectures. No traditional professor would have done that. Also: for forming groups, there’s nothing like closing the door. People need to be able to let go and try a lot of ideas. Q: I am from the Sudan. How do you create a safe space in environments that are exclusive. [I may have gotten that wrong. Sorry.] How do you acknowledge the native American tribes whose land this institution is built on, or the slaves who did the building? Q: You used a kitchen as an example of a safe space. Great example. But kitchens are not established or protected by any authority. It’s a new idea that institutions ought to set these up. Do you think there should be safe spaces that are privately set up as well as by institutions? Should some be permitted to exclude people or not? (JP asks a student to respond): Institutional support can be very helpful when you have a diversity of students. Can institutional safe spaces supplement private ones? I’m not sure. And I do think exclusive groups have a place. As a consensus forms, it’s important to allow the marginalized voices to connect. Q [ head of Gann]: I’m a grad of Phillips Academy. As head of a religious school, we’re struggling with all these questions. Navigating these spaces isn’t just a political or intellectual activity. It is a work of the heart. If the institution thinks of this only as a rational activity and doesn’t tend to the hearts of our students, and is not explicit about the habits of heart we need to navigate these sensitive waters, only those with natural emotional skills will be able to flourish. We need to develop leaders who can turn hard conversations into generative ones. What would it look like to take on the work of developing social and emotional development? JP: Ive been to Gann and am confident that’s what you’re doing. And you can see evidence of Andover’s work on it in the students who spoke tonight. Someone asked me if a student became a Nazi, would you expel him? Yes, if it were apparent in his actions, but probably not for his thoughts. Ideally, our students won’t come to have those views because of the social and emotional skills they’re learning. But people in our culture do have those views. Your question brings it back to the project of education and of democracy. A couple of reactions to this discussion without having yet read the book. First, about Prof. Fisher’s comment: I think we are all likely to agree that modeling the behavior we want is the most powerful educational tool. JP and Prof. Fisher, are both superb, well, models of this. But, as Prof. Fisher noted in his question, the dominant model of discourse for our generation silently (and sometimes explicitly) favored males, white middle class values, etc. Explicit rules weren’t as necessary because we had internalized them and had stacked the deck against those who were marginalized by them. Now that diversity has thankfully become an explicit goal, and now that the Internet has thrown us into conversations across differences, we almost always need to make those rules explicit; a conversation among people from across divides of culture, economics, power, etc. that does not explicitly acknowledge the different norms under which the participants operate is almost certainly going to either fragment or end in misunderstanding. Second, about the need for setting a baseline: I’m curious to see what JP’s book says about this, because the evidence is that we as a culture cannot agree about what the baseline is: vociferous and often nasty arguments about this have been going on for decades. For example, what’s the baseline for inviting (or disinviting) people with highly noxious views to a private college campus? I don’t see a practical way forward for establishing a baseline answer. We can’t even get Texas schools to stop teaching Creationism. 1. Modeling is essential but not enough. 3. …But we are not going to be able to agree on a meaningful baseline for the U.S., much less internationally — “meaningful” meaning that it is specific enough that it can be applied to difficult cases. 4. But modeling may be the only way we can get to enough agreement that we can set a baseline. We can’t do it by rules because we don’t have enough unspoken agreement about what those rules should be. We can only get to that agreement by seeing our leading voices in every field engage across differences in respectful and emotionally truthful ways. So at the largest level, I find I do agree with Prof. Fisher: we need models. 5. But if our national models are to reflect the values we want as a baseline, we need to be thoughtful, reflective, and explicit about which leading voices we want to elevate as models. We tend to do this not by looking for rules but by looking for Prof. Fisher’s second alternative: values. For example, we say positively that we love John McCain’s being a “maverick” or Kamala Harris’ careful noting of the evidence for her claims, and we disdain Trump’s name-calling. Rules derive from values such as those. Values come before rules. I just wish I had more hope about the direction we’re going in…although I do see hopeful signs in some of the model voices who are emerging, and most of all, in the younger generation’s embrace of difference. Jenn Halen, Sandra Cortesi, Alexa Hasse, and Andres Lombana Bermudez of the Berkman Klein Youth and Media team are leading about a discussion about AI and Education at MIT Media Lab as part of the Ethics and Governance of AI program jointly at the Harvard’s Berkman Klein Center for Internet & Society and the MIT Media Lab. Sandra gives an introduction the BKC Youth and Media project. She points out that their projects are co-designed with the groups that they are researching. From the AI folks they’d love ideas and better understanding of AI, for they are just starting to consider the importance of AI to education and youth. They are creating a Digital Media Literacy Platform (which Sandra says they hope to rename). They show an intro to AI designed to be useful for a teacher introducing the topic to students. It defines, at a high level, AI, machine learning, and neural networks. They also show “learning experiences” (= “XP”) that Berkman Klein summer interns came up with, including AI and well-being, AI and news, autonomous vehicles, and AI and art. They are committed to working on how to educate youth about AI not only in terms of particular areas, but also privacy, safety, etc., always with an eye towards inclusiveness. They open it up for discussion by posing some questions. 1. How to promote inclusion? How to open it up to the most diverse learning communities? 2. 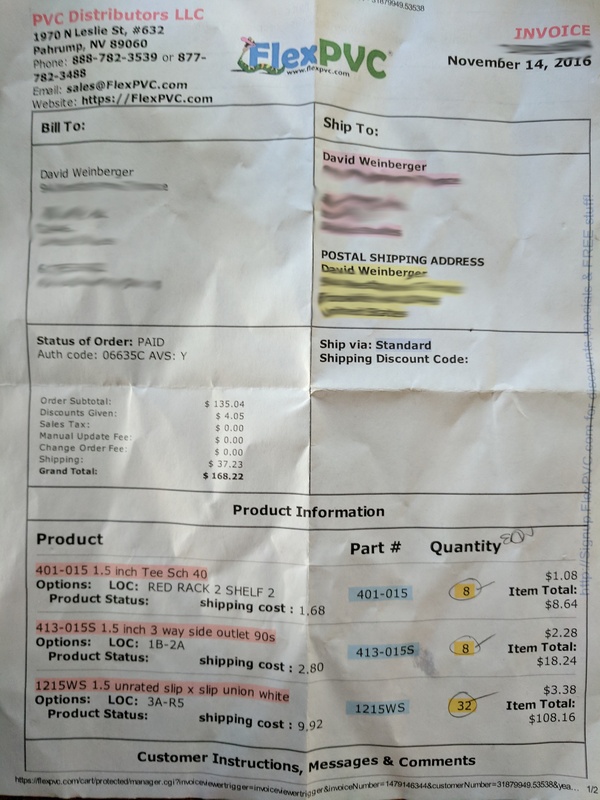 Did we spot any errors in their materials? 3. How to reduce the complexity of this topic? 4. Should some of the examples become their own independent XPs? 5. How to increase engagement? How to make it exciting to people who don’t come into it already interested in the topic? How to screw up a succah. In a good way. I know you’re all wondering how I was able to build such a magnificent succah, and how I managed to combine inexpensiveness with convenience. But most of all, you’re wondering what the hell is a succah? A succah is essentially a temporary Jew shack that you eat in during the holiday of Succos (AKA Sukkot). It has to meet certain requirements that make it somewhat sturdier than a pillow fort: It has to be temporary, covered incompletely on top, closed on at least three sides, etc. If you’re an observant Jew, as elements of my family are, you eat all your meals out there during the 8-day holiday. Some Jews even sleep in them. Far more commonly, the custom is to have guests as often as possible so that meals are extended and highly social. In some Jewish communities, succah-hopping is a thing. A good thing. This is fine except for my constant anxiety about wind overcoming the friction that holds the slippery tubes into their slippery connectors. So, every year after I’ve pounded the poles together — and, if you try to visualize the process you’ll see that pounding a tube into one sleeve unpounds it from the sleeve at the other end — I’ve drilled a hole through the sleeve and tube and inserted a weenie nail, just to add some charming shrapnel to the explosion when the wind suddenly tosses it apart like a child knocking down a house made of drinking straws. 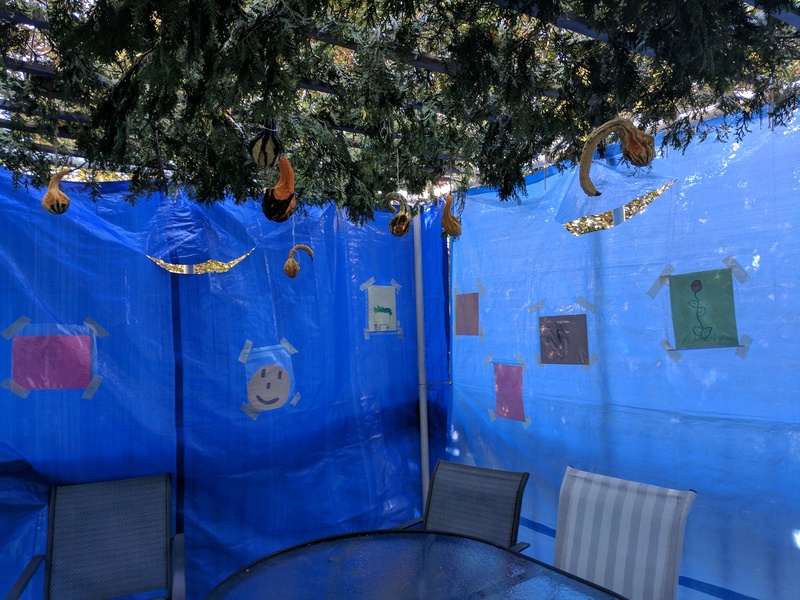 So, I did some research and this year built a succah using a remarkable breakthrough in applied physics: threaded connectors. Here’s how. Our succah is 10′ x 10′. Each side wall consists of two corner uprights, one upright in the middle, and four horizontal poles. The uprights have have fittings with a threaded nut. The horizontals have fittings that screw into the nuts. 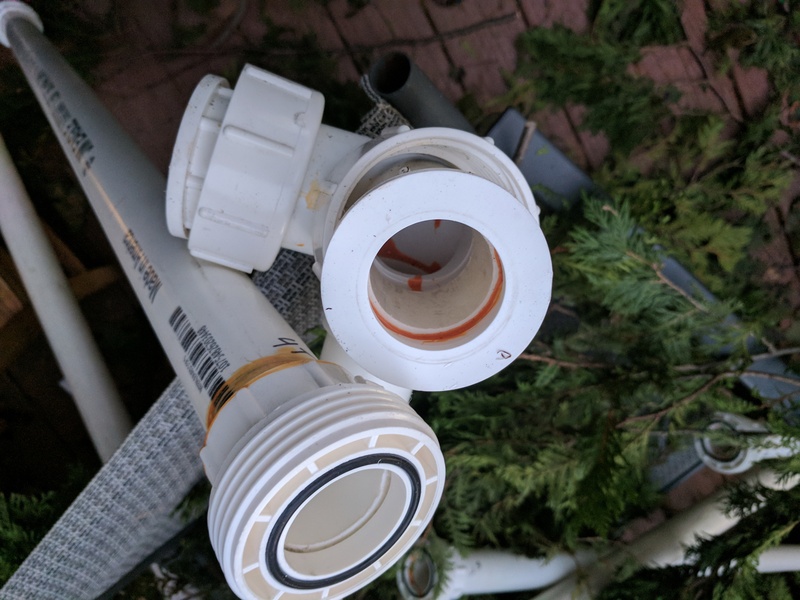 The fittings are glued on to the poles using PVC glue. You simply screw all the pieces together. It’s a little more complicated than that, though, because everything is. 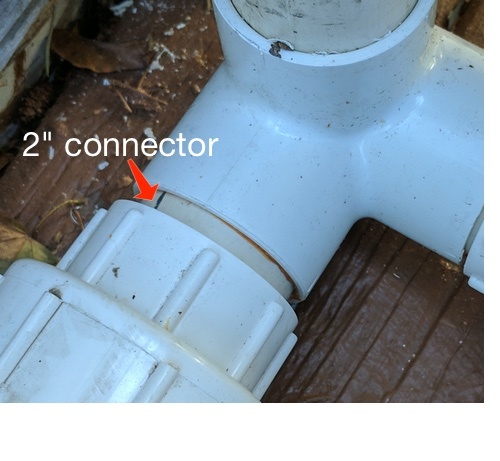 The threaded fittings are sleeves. 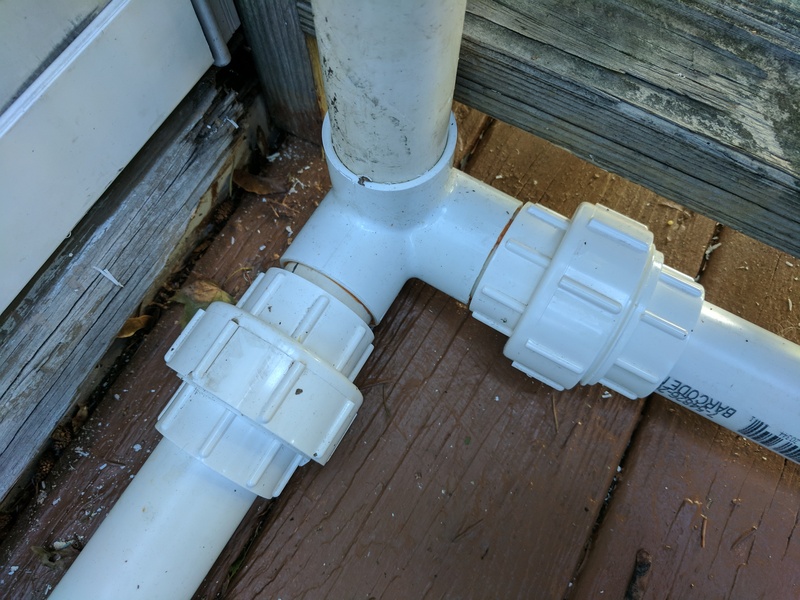 But because they’re all designed to connect to lengths of pipe the way you might want to connect one garden hose to another, you can’t use them to connect pipes perpendicularly. But every joint in this construction connects a horizontal to an upright, which means you need 90-degree turns. Now assemble the pipes. Our uprights are 7′. The horizontals are 47″ each, which, with the additional lengths imposed by the fittings, worked out to about 10′. But if you need exactness, you should cut them to fit. Just remember to label them so they’ll go together next year. Also, wear eye protection: the pipes cut easily with a circular saw, but it creates a lot of flying plastic jaggies. You might want to get ourself a spare or two. I’m still amazed that I got away without needing one. Note that the outer rings tighten counter-clockwise. You have to get the pieces lined up pretty well to be able to screw them together. I suggest that you assemble it from the ground up so that you won’t have to expand magic suspending pieces in mid-air.